Gaiwan - do you use it? Recently husband broke 1 teacup and chipped the other one of the same set. Choice is either to replace those (thermo cups), which I think they are practical but don’t like that the rim is a bit too thick for my appreciation of tea. I’m eyeing at some simple white porcelain gaiwan. Personally, I have never used one, but at teashops, I saw the sellers using them when sampling tea. Do you use that? 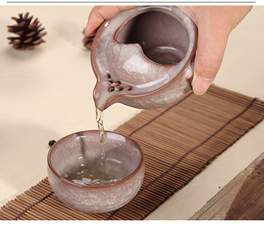 Do you use it like a teapot or rather, you drink directly in the gaiwan? Which size do you own? I really like Gaiwan. No, I use them like tea pots for brewing only. I don’t directly drink out of them – however you can. I have 10 or more Yixing Purple Sand teapots, and a few of Gaiwan teacup sets. Now, I am 99% using Gaiwan. Currently, I use these two the most. These two meant to imitate the older pottery with that hue of blue and with some imperfections (like black specks). One in my office and one at home. I usually go for 100-150 mL – however, this depends how volume is measured. Often times, sellers list the volume up to the rim, but no one really fill it up to the rim. So I use a Gaiwan which can handle 100-125 mL with ease which means the the volume up to the rim probably is >160 or even >180 mL. Your choice also depends the size of your hand and your preference brewing volume as well. Hey, you may like to brew 500 mL each time, but your hands may not be big enough to hold a 500 mL Gaiwan. I have a few white porcelain Gaiwan teacups. This one below is my favorite. Even then I don’t use it often compared to the two above. One thing about pure white porcelain is that they get stain more easily, so you may feel the need to clean it more often. What kind of tea do you like again? I think you like Red tea (Chinese call Red tea; Westerners call Black tea), right? I think you can brew Red tea in Gaiwan or Yixing teapots. For green tea, you definitely only want to use porcelain Gaiwan. If Gaiwan teacup seems a little too difficult, then you can always opt for the Quick Guest Cup set. Have fun! What kind of tea do you like again? I like green tea, like Dragon well or Oolong. Husband like red or green tea but steep much longer. I think it will be better if each of us have its own gaiwan for separate tea. One of the argument is that for more expensive tea leaves, we should buy a smaller one for more flushes… with less leaves. 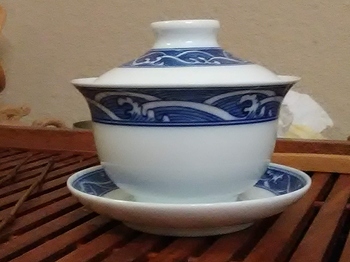 Is there a difference if I use a bigger gaiwan with the same amount of leaves and same amount of water as in a smaller gaiwan, will the extra “space” or air inside the bigger one made an inferior tea compared to a smaller one? Honestly, I think there isn’t a big difference within reason. e.g., I really don’t think there is a difference to use a 80 mL Gaiwan vs a 120 mL Gaiwan. 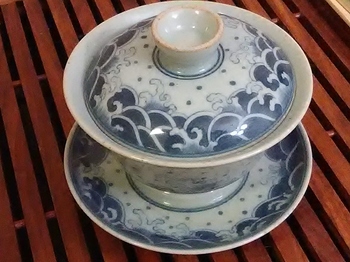 Now, if you use so much water that it is close to the rim of the small Gaiwan, then it will be a mess. If you use too little water in a huge Gaiwan, then the water may cool down too fast and difficult to pour. The size thing is a bigger issue for Yixing purple teapot and particular for Oolong tea. 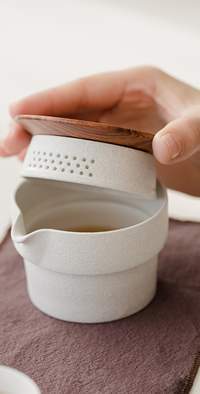 For Oolong tea, the argument is to use as small as a teapot as possible and with very little air space to not allow the tea fragrance to escape and as little temperature change. For other tea, the argument is less. In fact, I have heard many people want more air space and more escape for Pu Erh tea. Gaiwan (porcelain or clayware or even glass), unlike Yixing clay teaport, is not suppose to impair favor to the tea leaves, so you can brew different tea leaves with the same Gaiwan teacup. Some may say you shouldn’t do that for Yixing teapots. Now, I do recommend your husband and you get different Gaiwan. Mostly because Gaiwan teacups are not that expensive and your husband’s hand size may be different than your hand size. You should pick a Gaiwan that feel comfortable to your hand. 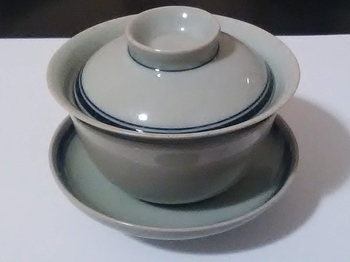 You can get Gaiwan with a wide price range. I have seen $5 or less Gaiwan. The white one you see above is $15 US dollar. The second blue one in the middle is $60. Of course, some can go to several hundred dollars. I would recommend you try a $10-20 one at first.